We enjoy getting out into nature year-round to experience everything it has to offer, and we always feel better for it. There is growing scientific evidence that “contact with nature” provides tangible benefits to human health and well-being. This is especially true in urban areas where we continue to lose our natural environments to encroaching development. The Harper Creek Wetland and the Brook Trout population of Harper Creek are important components of Peterborough’s natural heritage. They are rare remnants in the increasingly urbanizing landscapes of Southern Ontario. We are pleased that we could help support this collaborative science project that will shed light on the ecology of Harper Creek. 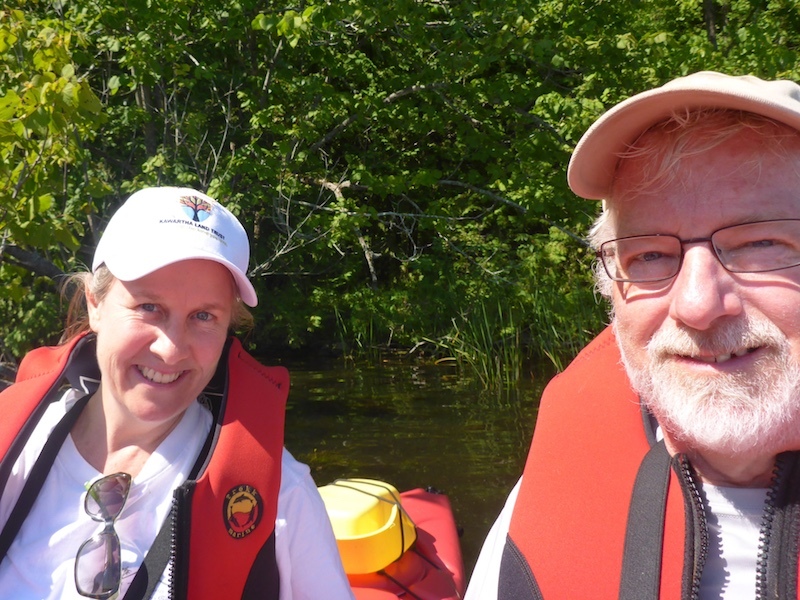 Janet and Warren enjoying a paddle around Big (Boyd/Chiminis) Island a Kawartha Land Trust property on Pigeon Lake. We don’t know for sure, of course, but our brook trout looks like it might be a female. The Brook Trout of Harper Creek are, on the whole, quite small due to their limited food resources in this cold water environment. For those reasons, we have decided to name our trout “Sally” a diminutive form of the genus Salvelinus. 2) body length is correlated with sexual maturity. Basically, Sally has to grow rapidly enough to survive to reach a length that is consistent with entering her adult stage of life. But complicating Sally’s seemingly straightforward goal is the diversity of variables within her stream habitat, and how she will choose to maximize her fitness when faced with differing conditions. Environmental drivers like temperature and stream flow can influence parameters such as growth, movement and survival (Letcher et al. 2015). For instance, if Sally was a trout in a very cold mountain stream where food is limited, instead of a more temperate and productive southern Ontario headwater, she would likely grow much more slowly, mature later, and live longer, perhaps up to 3 times longer than her warmer water contemporaries (Kennedy et al. 2003). But it is also likely that Sally’s cold mountain stream contains fewer fish species, so the need to reach sexual maturity quickly in order to establish a foothold for future generations isn’t paramount. Environmental factors also impact young fish differently than older fish. Letcher et al. (2015) found that older fish grow faster when stream velocity is higher because they are more capable swimmers. Being able to swim in the current gives them a better chance of finding food while expending less energy than a younger, smaller fish would exert. Younger fish can also benefit from higher flows, but only when stream waters are warmer. Changing seasons play a role in growth rate and the seasonal changes in temperature and flow in Harper Creek will affect all ages of brook trout that reside there. Cold winter water temperatures combined with fast flowing water present both a foraging and predator avoidance challenge, while low flows and high temperature in summer months decrease survival rates for cold water fish such as brook trout. Every species has an optimum range for growth and health, and once outside of this range individuals must adapt to sub-optimal conditions as a matter of self-preservation. Behaviour has a role to play in growth too, particularly in newly hatched trout who must compete with each other for food in the water column. 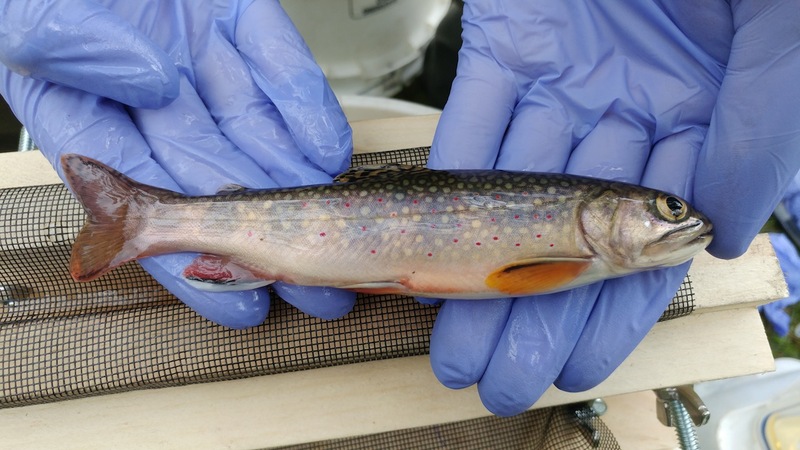 A field study of brook trout hatchlings in stream pools returned some surprising results: aggressive fish grew faster whether they were sitting on the bottom eating crustaceans, or actively foraging for insects in the top layers of the water column. It seemed that less decisive, non-aggressive trout, and those who switched up their method of hunting, were less successful in capturing a meal which in turn, slowed their growth rate (McLaughlin et al. 1999). Age, season, stream flow, water temperature and individual personalities all play a role in establishing growth rates and survival in brook trout. But with all of the complexity, one thing is for certain, Sally brook trout will enact a strategy uniquely suited to survival in Harper Creek, and won’t it be fascinating to learn more about this little trout when the data is in! Kennedy, B.M., D. P. Peterson and K. D. Fausch. 2003. Different life histories of brook trout populations invading mid-elevation and high-elevation cutthroat trout streams in Colorado. Western North American Naturalist: 63: 215-223. Letcher, B.H., P. Schueller, R.D. Bassar, K.H. Nislow, J.A. Coombs, K. Sakrejda, M. Morrissey, D.B. Sigourney, A.R. Whiteley, M.J. O’Donnell and T.L. Dubreuil. 2015. Robust estimates of environmental effects on population vital rates: an integrated capture-recapture model of seasonal brook trout growth, survival and movement in a stream network. Journal of Animal Ecology. 84: 337-352. McLaughlin, R.L., M.M. Ferguson and D.L.G. Noakes. 1999. Adaptive peaks and alternative foraging tactics in brook charr: evidence of short-term divergent selection for sitting-and-waiting and actively searching. Behav Ecol Sociobiol. 45: 386-395.